I did my first ever session a few months ago, I did a session called “Why you should learn F#”. I spent 30 minutes sweating and stuttering about pipelines and discriminated unions, people reactions were “Ok nice, but why is it better than C#, why do I need this, show some more code comparisons”. At first, this is what I NOT wanted to do, go the F# is better then C# blablabla way. I don’t hate C#. But I would like F# to be the language I use for projects at work, so if this is the way to convince people/companies to use F#, so be it. To show the difference I simplified the code from a tool I wrote in F# and translated that to C#. I kept the C# in the same file, that removed some more code you normally had to add if you follow the C# code guidelines. The screenshot says it all I think, you can see how many, unneccesary, noise is added to the C# code. That’s all for now, this is just one argument of the F# over C# story. Sorry I had to squeeze this one out a little, last year when I saw the fsadvent and I was like “Next year, I’m going to write an awesome blog about how I learned F# by blogging this year”. Well I learned some F# and did some blogging, but waaaayyy less then I hoped. So next year, I will again try to make the world safe for fsharpocracy. So this was fun… again, learned a lot… again! I blogged before about building a simple crud app that used a type provider and that worked pretty good, until I wanted to configure my continuous integration in VSTS. This didn’t work as smoothly as I wanted, because the type provider needs to connect to the database during the build. I read that I had to cache the definition or have the database setup before the build task, but still it felt uncomfortable. I thought, well why not take a look closer to home and use Entity Framework. Latest bits of course, because why not. Example code is on GitHub. UPDATE 8/15/2018: GitHub example is updated because of some issues and there might be some other issues not fixed right now. Yes, this went pretty well. I thought I had to create mutable types to work with EF, but just adding the [<CLIMutable>] was enough. This makes the type just mutable for the compiler, not for us mortal developers. I defined a separate type for record ids because I can! Love this. Then I got all kung fu by using the and keyword, known as mutual recursive types, so I could have a Serie with a list of Episodes and have those Episodes have a navigation property to Serie. I made the latter an Option type and made sure it wasn’t mapped by using [<NotMapped>]. That way I can just create an instance of an Epsiode and later add it to a Serie. Time for some abstraction over the EF bits by using a repository. I don’t if this is all functional, so suggestions are welcome. I started with the getSerie function by trying to work with the FirstOrDefault method. Stackoverflow convinced me to be more FSharpy and use the Seq.find which flow more nicely I think. The add functionality was simple, I struggled with the update a little more because I was used to Attach entities back to context or set it Modified. It might look if this code will do an extra call to the database, but this is only if the entity isn’t loaded before. Otherwise the entity is retrieved from the context (memory). I wanted to know how to do some Linq-like queries use I created a getSeriesWithAiredEpisodes function to try that out. Had some light bulb moments trying Async, this isn’t my strong point in C# either by the way. Last but not least, applying the configuration. Functional applying that is! I created a CompositionRoot module so that the context is applied to the repository functions. Here you might set the connection strings too. I used the (func () -> …) construction (don’t know how this is called) so that if you need the create a separate context, just call this function. As you can see in the code on GitHub, this sample works with SQLite and SQL Server, just change the getContext function. So that’s it, Have fun with it! Comments, critique or suggestions = awesome & welcome! The initial goal was to do a simple Hello World with F# + Suave, I quickly found out my initial dev rig had some issues. So, I decided to start with a clean Windows Virtual Machine and then install it piece by piece, starting with Visual Studio Code. This results in a list of components that might not all be need to be installed, but I think like this you’ll have good a base to build applications on .Net 4.6 and .Net Core. There are at least two ways to create a basic project. One is to use to .Net core CLI, the other, what drove this blog post, is the functionality provided by Ionide-FSharp and the Command Palette of VS Code. This means pressing CTRL + Shift + P and selecting/typing F#: New Project. I didn’t create a .Net Core project yet, but an installation of the .Net core was needed to get things working. The next bits I didn’t install initially, the sample in the next blog could run without out it (works on .Net 4.6.1). I think you’ll need this to build F# applications that use .Net Core. With this I eventually could do create, run and debug a Hello Worldish console application. For more than a year I’m a spectator of the F# community, eager to learn something new but as a dad of two young boys no time & energy to really dive into to the material. Luckily, children do grow and a slowly I begin to claim back my life 😉 Time to pick-up some learning and blogging! I’m a Visual Studio C# guy, no previous experience with functional programming languages so this all new stuff for me. 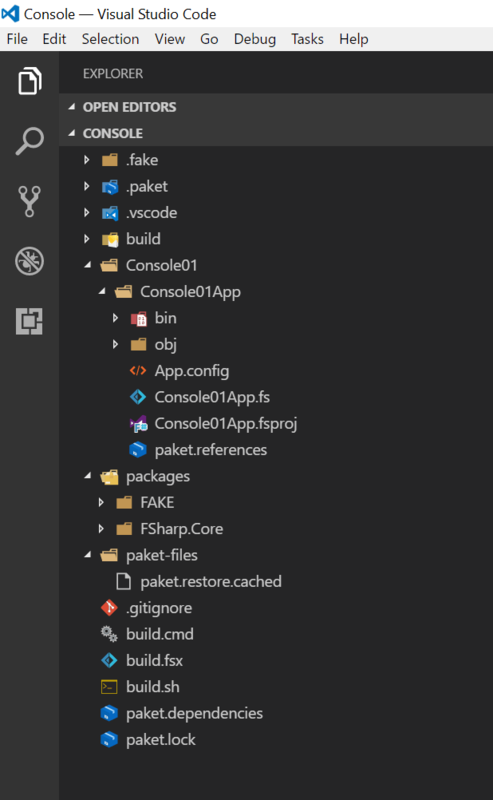 FAKE, build tools F#. As a Visual Studio guy, I never really bothered much with the ins and outs of the build, this seems a nice way to start doing this some more. Paket, this also seems to be the best thing since sliced bread according to some people. Azure, it would be cool to eventually use the continuous integration and deployment tooling to make all this 2017 proof. First things first, getting to a Hello World type of stage with the F# stack. This starts with a development environment, finding out how, what and installing this didn’t turned out to be a smooth and easy as I was led to believe. Big part of this is of course a lot new bits & bytes. So here is a blog with my findings to a get to a good start environment for developing F# stuff. The code is an example implementation, it’s about the concepts. It is a stripped down but pimped version of an implementation I did at a client I worked. The application needed to provide the users with a way to dynamically construct queries for their database. Some queries came preconfigured and I used the fluent API to create these. It also enabled me to create tests more easily. First let’s take a look at the object we’re building, the Query. This is a lot of code, not very readable, not very expressive. So now we will start with the first simple implementation for setting the table name and adding columns, we create the QueryBuilder with the method OnTable and AddColumn. The Done method is to signal construction is done and to return the actual Query object. Fairly easy and the results are already more readable code. But we’re not done yet, we’re now going to use a second builder to add the OrderBy and take these concepts even further. That’s it. I created a sample project and put it on GitHub.